Currently, our freecolour.org DIN SPEC business plan was published for 4 weeks from 19.02.2018 to 19.03.2018 on the DIN website for comment. In this DIN SPEC we will define tools and procedures for open and transparent color communication from design to finished product based on CIELAB color values, physical samples according to ISO12647-7 and spectral data in CxF3 format according to ISO 17972. DIN SPEC describes both the way to create physical samples and CxF spectral data for any CIELAB color values by the user and the basic parameters of an open reference color system, which is available to all users without license costs under a Creative Commons license. The work equipment described in DIN SPEC is particularly suitable for tasks in which colours are defined in design for various production processes and communicated to manufacturing companies by means of physical samples and spectral data. The procedure described in DIN SPEC is intended to enable the production of matt, silk-matt and glossy colour samples on closed unstructured surfaces. With DIN SPEC 16699 “Open Color Communication” we at freieFarbe e.V. would like to show that with open tools and procedures as well as Creative Commons licenses, in particular the CIELAB standard, ICC-based color management and ISO standards for spectral data, color communication is possible on a professional level. 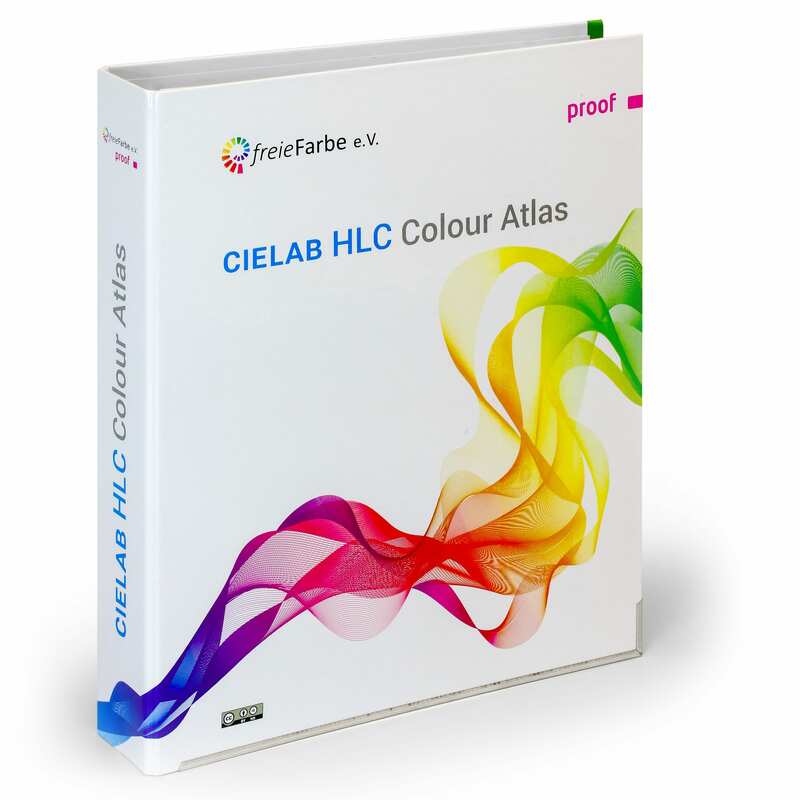 It has taken almost a year, but we are all the more pleased now: The “CIELAB HLC Colour Atlas” is completed and can be ordered in our shop. 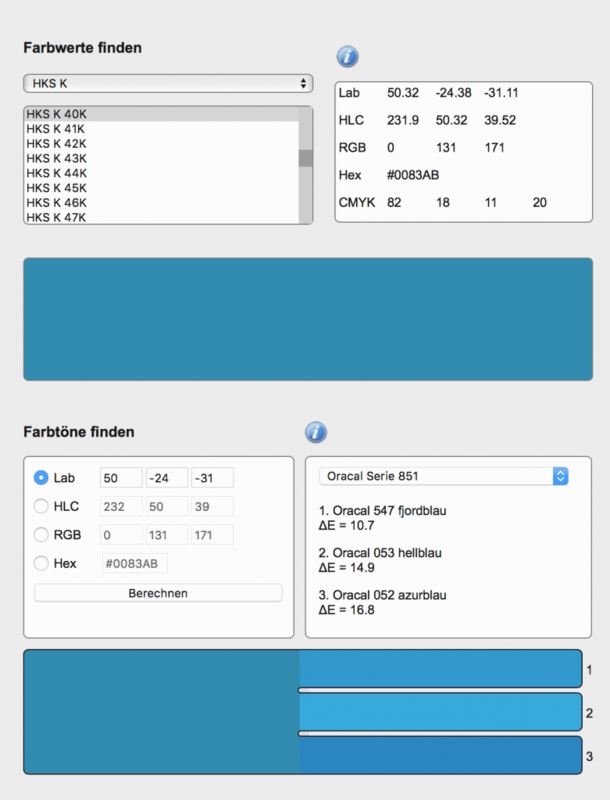 The HLC Colour Atlas is a open source, high-precision colour system based on open standards. 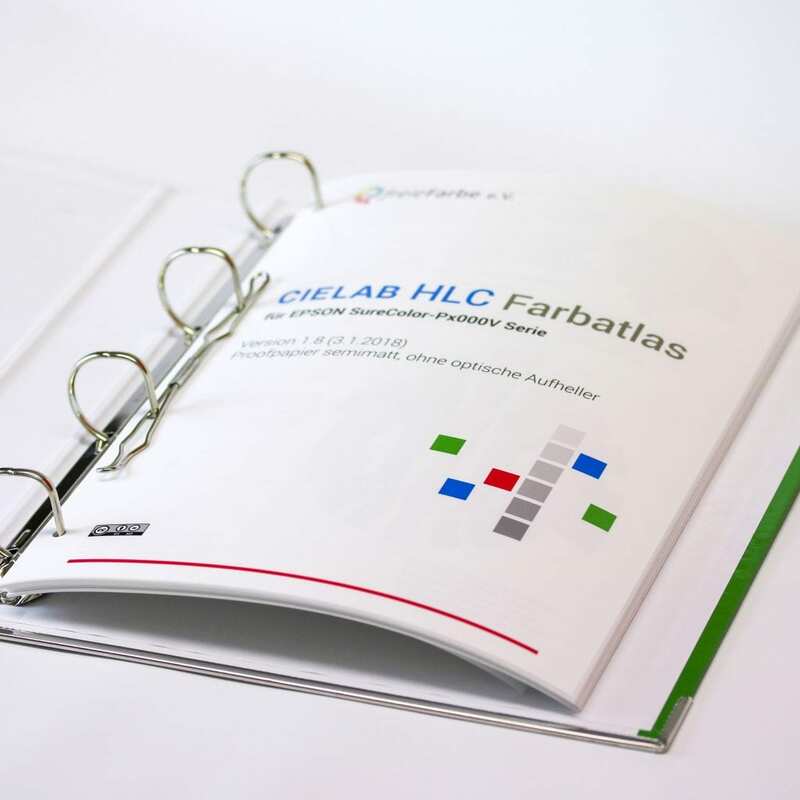 The CIELAB HLC colour atlas is based on open, non-proprietary standards that are free of copyrights and trademarks. The colour atlas with all components is available to all users free of charge online and can be downloaded, used and passed on directly. It is released under an OpenSource Creative Commons license. 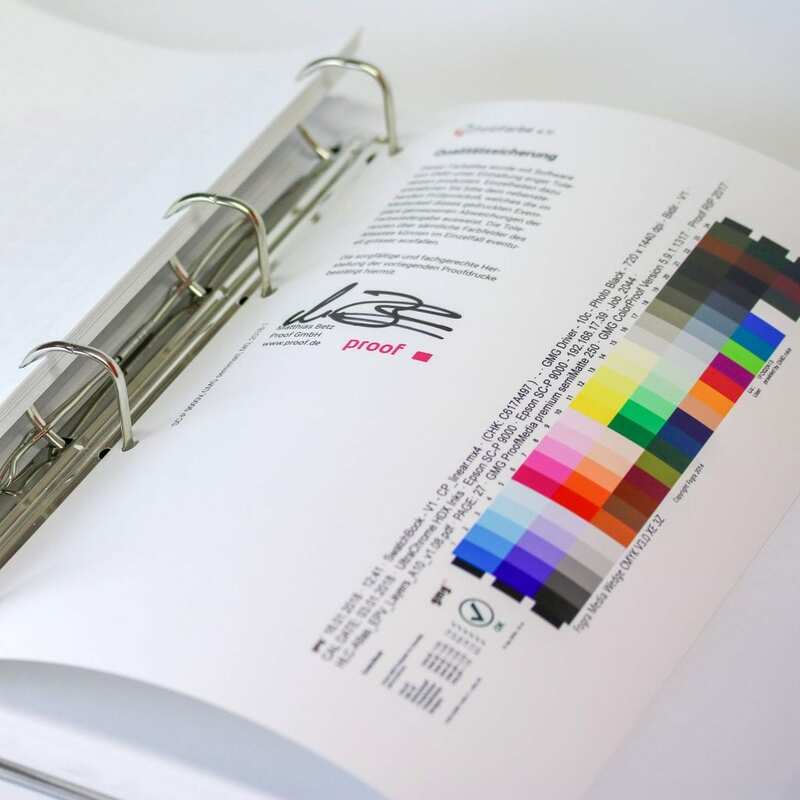 The printed reference of the CIELAB HLC colour atlas impresses with outstanding precision and, unlike some commercial products, the colour accuracy is extremely high with a DeltaE00 median of 0.3 and an average DeltaE00 of 0.5. In most cases, the deviation from the ideal colour reference and colour differences between two colour atlases can be measured, but not perceived by the human eye. 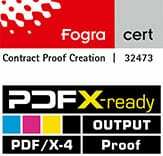 Each atlas is produced on our best Fogra-certified high-end proofing printer on Fogra-certified paper. 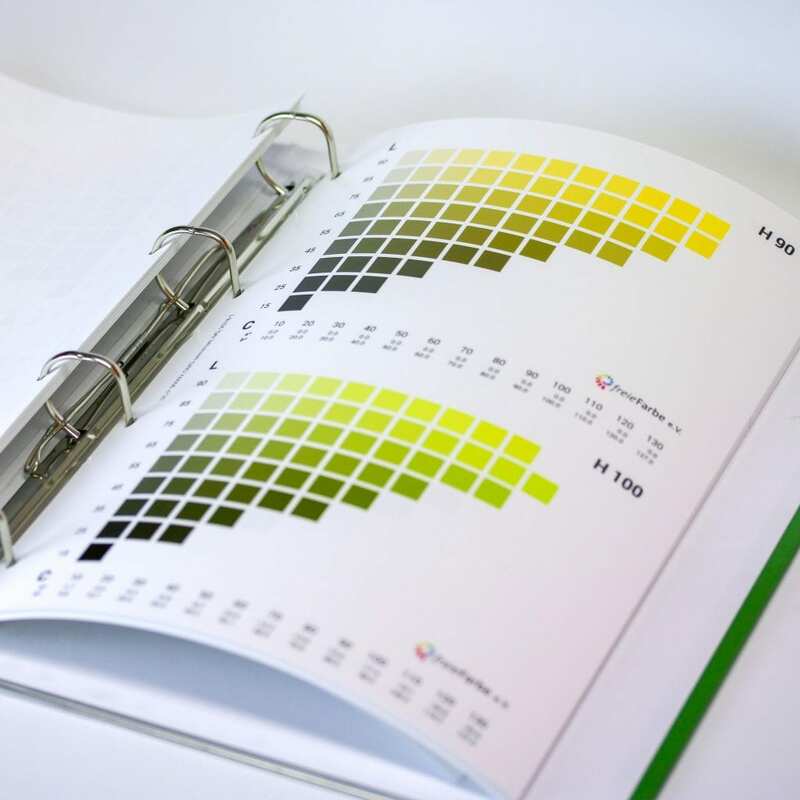 Each copy is delivered with an individual, colorimetric test report in accordance with ISO 12647-7:2016 to document the color accuracy of each individual color atlas. 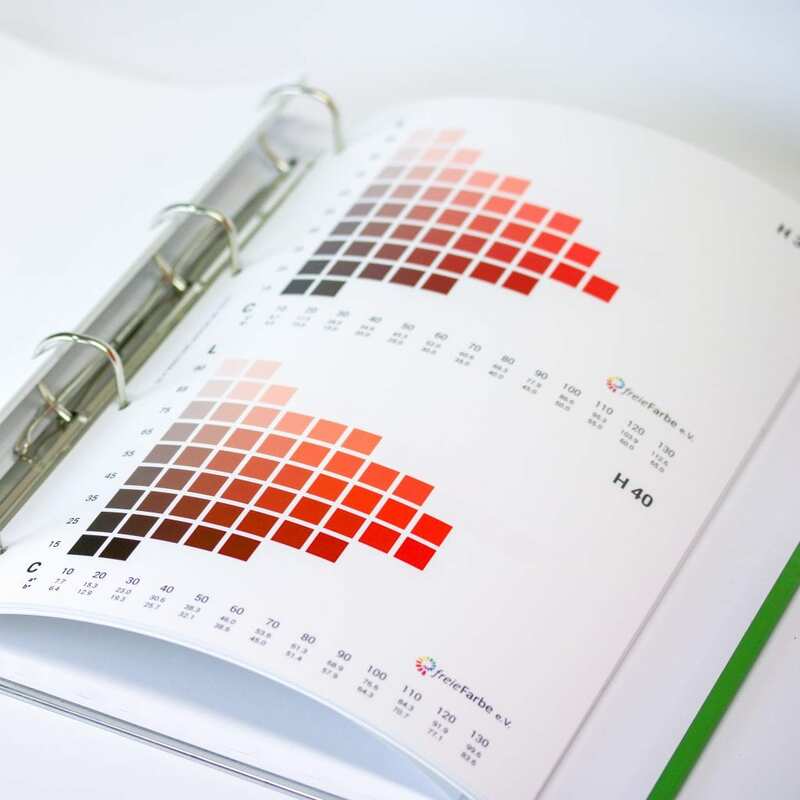 A printed colour atlas master reference (A4, ring binder) with 2040 colours, based on the intuitive HLC colour model (Hue, Lightness, Chroma), with shades of 10 between the individual colours. This also includes colors that are not reproducible in normal CMYK workflows (jewelry colors). This component is produced with the greatest care in Tübingen. 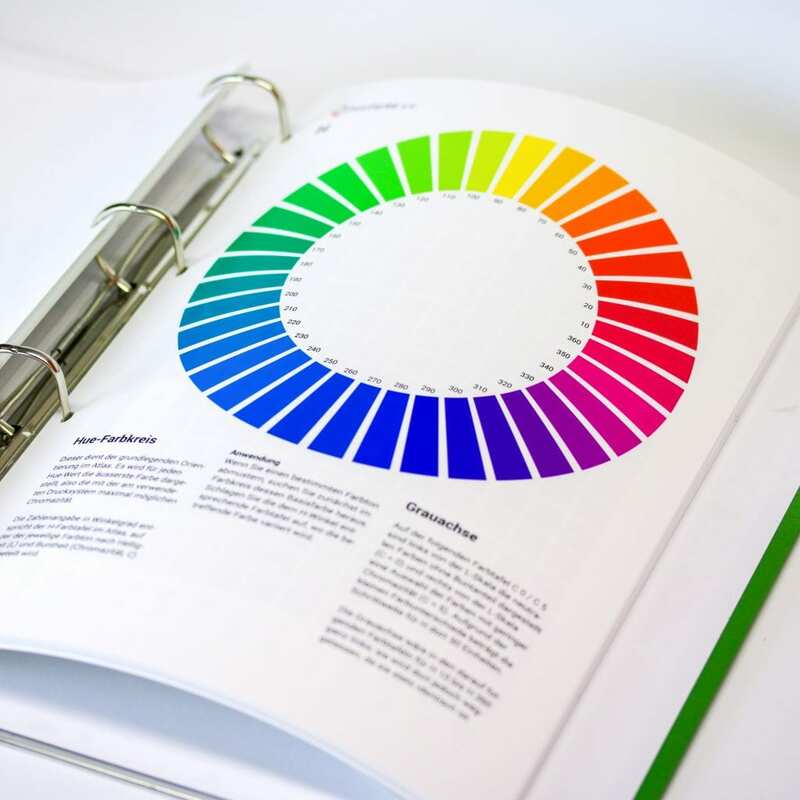 The colour atlas contains an introduction and instructions for use in German or English. A free PDF-Master version of the color atlas, which also displays numerous other color spaces such as sRGB, Fogra39, Fogra51 and 52 etc. via layers in the PDF file. Color palettes with all 2040 LAB values for Adobe software in ASE format. We provide this library in a timely manner also in the SBZ format of Swatchbooker as well as in sRGB versions for LibreOffice (SOC), GIMP (GPL) and Scribus 1.4. x (XML). Scribus 1.5. x already contains the SBZ-file and a sRGB-version is shipped with LibreOffice since version 5.4.4.4, as well as with the current stable version Scribus 1.4.6. A table with color conversion values of all colors of the atlas according to sRGB, HEX and ISOCoatedV2 in two rendering intents. Spectral data of all color fields in a CxF v. 3 file containing the color data of all color fields in spectral values. This file enables, for example, paint manufacturers to use all colours of the atlas with high precision spectral spectral data or to create their own reliable references – open source and without licensing fees. For example, an ink manufacturer can simply load the CxF3 file into typical color formulation software and create the right mix for its printing inks. This applies not only to offset printing, but also to coatings, textile inks and plastics. All files are available for free download under a CC license. 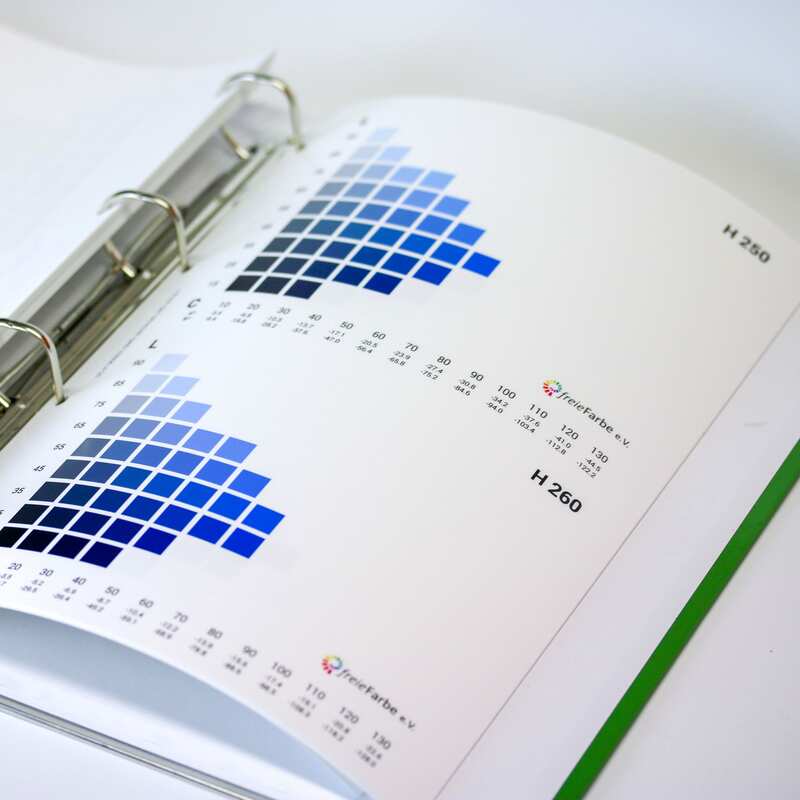 Only the HLC colour atlas printed by Proof GmbH is subject to a fee, as production is very labour and cost-intensive. The introductory price of EUR 99, – is valid until the end of April 2018, starting in May EUR 149, — plus VAT and shipping costs. 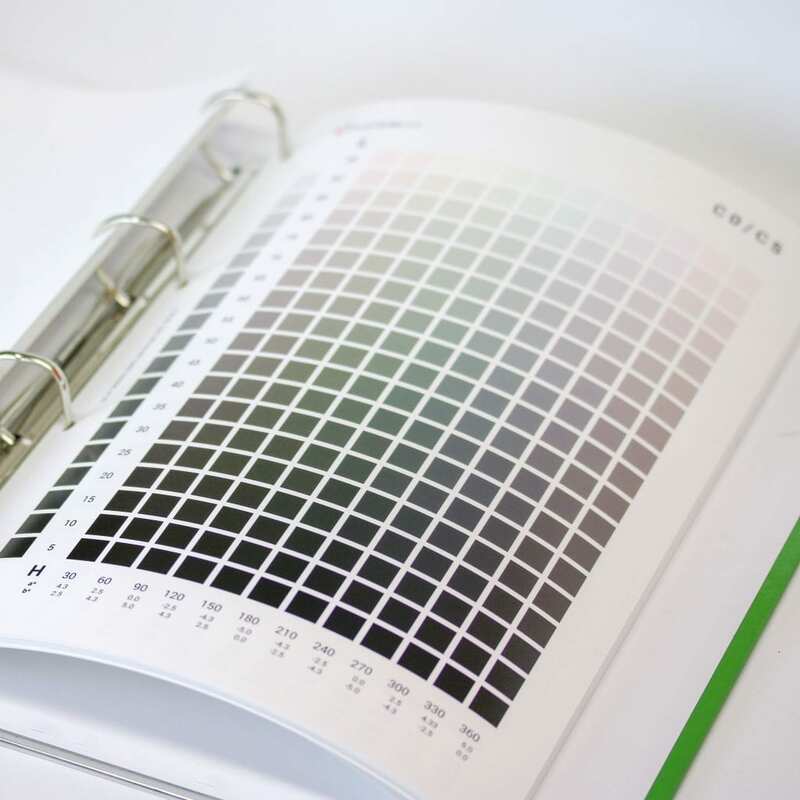 We at FreieFarbe e. V. and Proof GmbH not only see the “CIELAB HLC-Farbatlas” as a genuine and open alternative to the hundreds of proprietary color systems, but we also believe that the highest quality standard of the printed color atlas can only be achieved by coating systems. Since the beginning of January, we have also been working on converting our open colour system with the German DIN standards organisation into a DIN SPEC standard. Holger Everding (DPT Studio Oldenburg), Jan-Peter Homann (Homann Colormanagement), Eric A. Soder (pixsource. com), Peter Jäger (pre2media. ch) and Matthias Betz (Proof GmbH) as well as Christoph Schäfer and Gregory Pittman (Scribus Team). freeFarbe e. V. also thanks for the support of ColorLogic GmbH with its software ZePrA for special color optimization and ColorAnt for the acquisition of spectral data, Epson Deutschland GmbH for support with ink and GMG GmbH & Co. KG for the support with certified proof papers and their color proofing software. freeColor e. V. is a consortium of German and Swiss color experts who work to produce consistent color in all areas of application. Sounds reasonable? Exactly. That is the issue that is of central importance to our proofing customers. Therefore we are currently working in a project with the colleagues of FreieFarbe e. V. and are now also as Proof GmbH member and partner of FreieFarbe e. V.
FreeColor relies on open standards such as LAB and HLC, which have long been integrated in computer software and want to show: the computer is an ideal tool for color, it can make color free! The association FreieFarbe e. V. aims to promote colour communication without pursuing commercial goals. 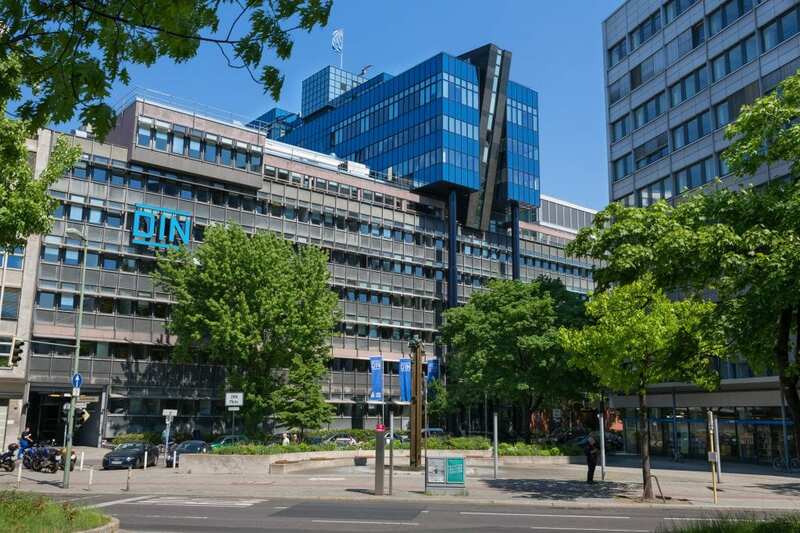 In recent months, Holger Everding, Peter Jäger, Eric A. Soder and Jan-Peter Homann have developed a completely new approach to this, which we were able to develop together with our colleagues into a product that we will present shortly. We would like to take this opportunity to point out a great feature of the website of FreieFarbe. de: The colour database: Here you can look up the most important colour values for more than 300 colour systems and calculate colour comparisons of all kinds. For the work within the association FreieFarbe e. V. the association is always looking for competent companions. If you, like us, are touched by the subject of colour in a variety of ways, there are many opportunities at fF to contribute with your knowledge and strengths. If you feel like our good cause, please contact us!